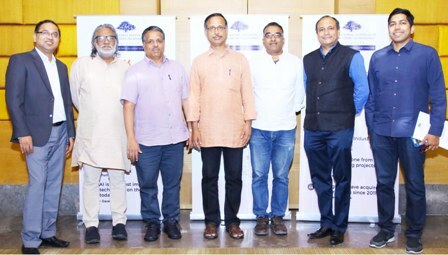 Hyderabad, April 26, 2018: IIIT-Hyderabad (IIIT-H) has announced that the first cycle of its Foundations of Artificial Intelligence and Machine Learning (AI/ML) program, conducted by its Machine Learning Lab in association with TalentSprint, has been a great success. The first cohort of 400 software professionals from 127 leading tech companies will graduate next month. The program is directed by Prof. C.V. Jawahar, Amazon Chair Professor and Head of the IIIT-H Machine Learning Lab, a leading authority in the field. IIIT-H further announced that its ongoing partnership with TalentSprint is now ready for scale. The executive education program is being expanded to multiple cities to create 10,000 certified AI/ML professionals over the next four years. The goal is to close the gap between state-of-art academic research and state-of-practice industry projects in terms of AI and ML expertise. According to Dr. P. J. Narayanan, Director, IIIT-H, “AI/ML is a deep and disruptive technology and we are making it accessible and digestible to industry professionals from diverse technology backgrounds. We are very encouraged by the enthusiastic response from participants who are hailing the design, delivery, and effectiveness of the program as a game changer. Based on this feedback, we have decided to roll out this executive program on AI and Machine Learning on a much larger scale in partnership with TalentSprint”. According to Dr. Santanu Paul, MD & CEO, TalentSprint, “AI/ML technologies are rewriting the entire narrative of the software industry. Even globally, there is a huge expertise gap. It has been said that there are barely 10,000 professionals in the world today with mastery over AI/ML technologies. The scale up we are announcing today will make it the largest executive education initiative in the field of AI/ML. We are very pleased to collaborate with IIIT-H and its highly-regarded Machine Learning Lab to make it happen”. International Data Corporation (IDC) forecasts that global spending worldwide for cognitive computing, machine learning, and artificial intelligence will continue to see significant corporate investment over the next several years, achieving a compound annual growth rate (CAGR) of 54.4% through 2020 when revenues will be more than $46 billion. According to Gartner, AI will add 2.3 million jobs by 2020. In this rapidly changing ecosystem, IT executives, irrespective of stage of career, need to acquire fluency in deep and disruptive technologies.